As the world is learning this morning, George Herbert Walker Bush, 41st President of the United States, passed away yesterday at the age of 94. While many online sites and other media outlets provide ample examples of traditional obituary content, Historyguy.com is looking at some of the historically significant facts related to this unique president, with a particular view to the connection of Bush’s war with Iraq to the wars of today. Bush, the son of a wealthy and powerful man, Senator Prescott Bush, was involved in many important events and points in history. Whether he is judged in a positive or negative light is, frankly, based on the reader’s own particular world view, but regardless of your views of Bush and his policies, there can be no argument that his impact on American and World history was significant. A lot of pundits will point to the fact that Bush was the last president to serve in World War Two (i.e. the “Greatest Generation”) and was the last real veteran of any sort to sit in the White House. What is historically significant about that fact is that he was of that generation and had real-world experience with war and war’s consequences, is how that influenced his world-view. Bush believed that America had to be engaged in world events in order to prevent the rise of another aggressor like a Hitler or a militaristic Japan. He shared this general view with other presidents of his generation, both Democrat and Republican. With this in mind, it is clear that Saddam Hussein’s invasion of Kuwait and the resulting Gulf War with Iraq triggered in President Bush (and his close NATO ally, Margaret Thatcher of the UK) a fear of an America that was disengaged from the world to the point that the horrors of the 1930s and 1940s could once again appear. 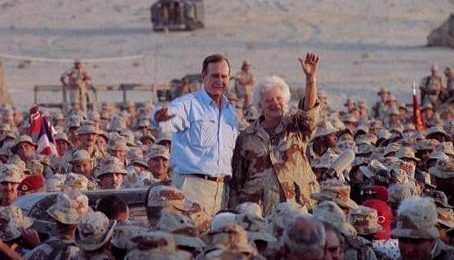 Of course, when President Bush sent half a million U.S. troops to the Middle East to oust the Iraqis from Kuwait, few could fathom that American troops would still be fighting and dying in that region (and still in Iraq itself) in 2018, more than 27 years later. What is the chain of events that leads from Bush’s decision to engage Saddam’s aggression to today’s post-9/11 wars? Again, some would contest these connections, but the causality is evident. Following the Gulf War, the U.S. maintained huge military bases in and around Saudi Arabia, and also continued to support Israel (in fact, Bush sent U.S. forces to protect Israel from Iraqi Scud missile attacks during the war). Osama bin Laden, who had received U.S. support during the Soviet War in Afghanistan, saw the continued U.S. presence in Saudi Arabia and the continued support of Israel as a casus belli for launching a jihad against America and the West. Fast forward to 1993, when President Bush sent troops to Somalia in a humanitarian mission related to the famine and chaos in that African (and Muslim) country. We now know that the first real act of al-Qaida’s jihad took place in Somalia against U.S. troops there, largely by providing weapons and training the Somali militias in how to shoot down American Blackhawk helicopters, which, of course, they were successful at doing. Later, of course, al-Qaida launched the infamous attacks on American soil on September 11, 2001, and that then set in motion the next round of American wars in and around the Middle East. Like the Butterfly Effect, the actions of President Bush in repelling Iraqi aggression in 1990 and 1991, and the resulting maintenance of American power projection in the Middle East had implications that, while clear today, could not have been anticipated in the 1990/91 crisis. President Bush’s tenure in office involved other, equally vital events as well, from the short, sharp war in Panama to the closing of the Cold War (hint: America won) and, of course, we could also look at how that major conflict’s end led to the rise of Putin and the current Russian aggression in Ukraine and their own power projection in Syria, but that may be a topic for a future post. In summary, President George H.W. Bush’s impact on history was significant, especially given the consequences of his actions on what the world looks like today. He saw naked aggression by what he saw as a two-bit dictator, and, with memories of America’s lack of vigor in the 1930s and early 1940s led to a world war, his decision to ensure that the aggression against Kuwait (and the threat to the Saudi oil fields) “would not stand.” The U.S. re-asserted itself as the predominant power in the world with that significant war, but unwittingly set in motion a chain of events that created the world of today. But isn’t that how all of history works? We study the past to understand the present, and to try to foresee the future. In this light, the presidency of George Herbert Walker Bush, and the decisions he made regarding the Middle East, had an impact that no one, least of all President Bush himself, could have foreseen.